Small island or big island? 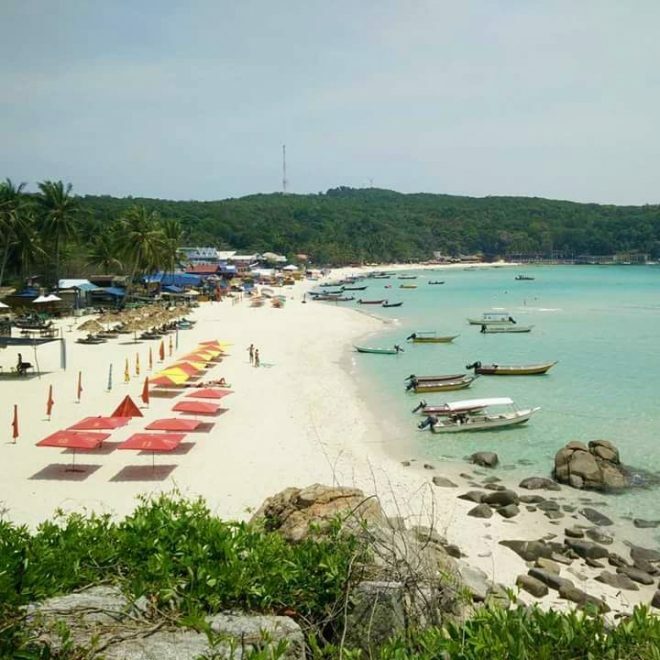 The two little sun-soaked jewels locally known as Pulau Kecil and Pulau Besar make up the tropical island duo referred to more commonly as the Perhentian Islands. Located off Malaysia’s northeast coast in the middle of the South China Sea, the Small Island (Kecil) and the Big Island (Besar) are a few of the remaining Southeast Asian escapes that have managed to retain their deserted-island vibe. The Perhentians, each just a few kilometers in circumference, have staved off commercialism for years. However, there’s no denying the appeal to further develop these islands. 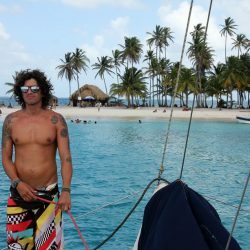 Every year, more tourists are drawn to their idyllic shores and fall under the spell of undeveloped beaches, make-shift beach bars, oceanfront bungalows, soft sandy shores, tranquil turquoise waters, and excellent diving. Take it from someone who lived and worked on these islands for two years – the Perhentians undoubtedly possess a magical charm! But I know it’s impossible for them to remain under the radar forever. Eventually, these islands will lose the battle to development and tourism. 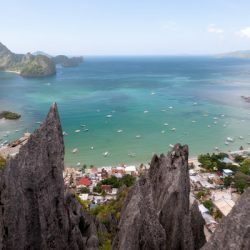 That’s why I encourage you to discover these islands as soon as possible – before their one-of-a-kind qualities disappear and they end up like most of the other “touristy” islands in Southeast Asia. 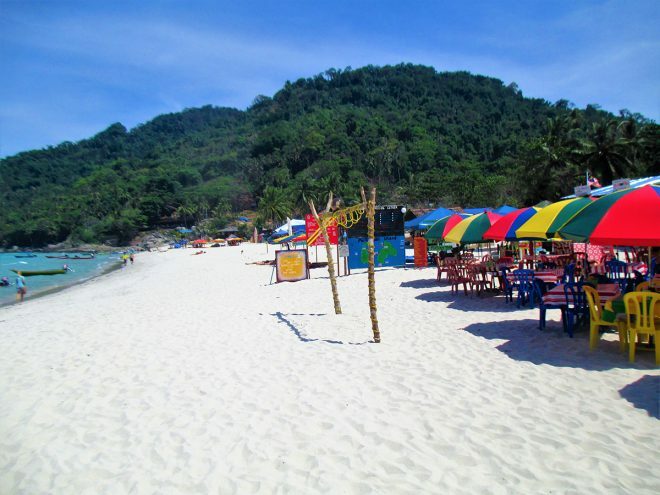 The seasons are the most important thing to consider before planning a trip to the Perhentians. These islands have two seasons: Dry season and Monsoon season. Dry season starts in March and runs about mid-way through October. Monsoon season picks up in October and runs through the end of February. Plan your trip during Dry season. 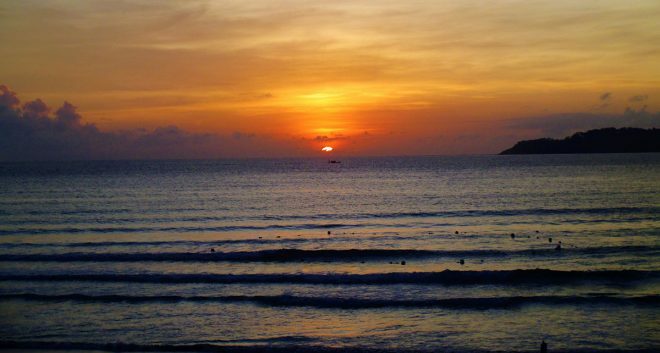 The weather is favorable (almost always hot and sunny), the sea is calm, the speed boats connecting the mainland to the islands run frequently, and all the islands’ restaurants and accommodations are open. Visiting in Monsoon season is nearly impossible and would be pretty unpleasant anyway. While there may still be boats running from the mainland to the islands during these months, all accommodation and most restaurants are shut down during this time. The islands are completely void of life except for the locals who live year-round in the village. If you visit in Monsoon season, you could easily find yourself stranded with nowhere to sleep or eat! From the Malaysian capital of Kuala Lumpur, you can take a bus from TBS (Terminal Bersepadu Selatan) to the Kuala Besut Bus Terminal. One of the most popular bus companies is Perdana and one-way tickets start at 44 Malaysian Ringgit ($11 USD). Perdana has four daily departure times, but I recommend taking the overnight bus which leaves Kuala Lumpur around 9pm and arrives to Kuala Besut around 6am the next day. From the Kuala Besut Bus Terminal, it’s only a 5-minute walk to the Kuala Besut Jetty where the speed boats leave from. 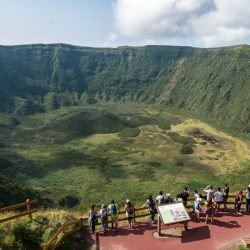 The overnight bus is a great option if you want to maximize your time on the islands. Arriving at 6am ensures you a spot on the first speed boat, which leaves at 8am. Thereafter, boats run based on need with no fixed schedule until around 4pm. The cost of a one-way boat ticket is 35 Malaysian Ringgit ($8.50). You will take the same speed boat back to Kuala Besut Jetty from the islands. There are three fixed departure times; 8am, 12pm, and 4pm, however you may be able to find boats leaving at other times. Perhentian life can be sporadic! You can purchase your ticket from the small mom n’ pop shops along the beaches or talk to your guesthouse manager. 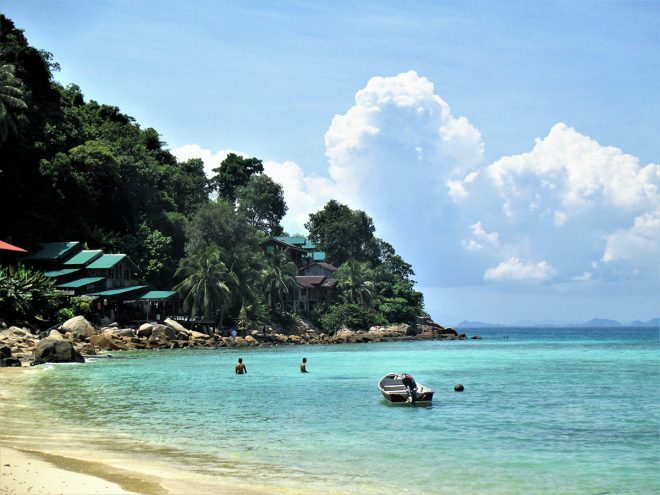 The “Perhentians” are just two islands; the Small and the Big. They are just a stone’s throw away from one another and the Kuala Besut boats take visitors to where ever their final destination may be. The 1-kilometer strip of sand known as Long Beach on Pulau Kecil is by far the most popular and action-packed area of the Perhentians. This beach houses the majority of the island’s budget accommodation, beach bars, restaurants, and dive shops in addition to the most luxurious resort on the island (Bubu’s Resort). 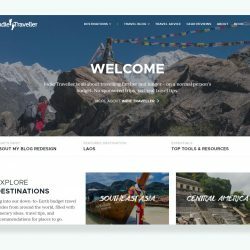 Its biggest appeal to young backpackers and budget travelers is its notorious nightlife which supplies ample opportunities to party, mingle, and meet fellow travelers. The other side of Kecil – known as Coral Bay – is quieter and more relaxed with fewer accommodation options and several laid-back beach restaurants. Plan to post up on this side if you want to stay on Kecil but prefer to be removed from the party scene. Long Beach is the most popular area to stay on the Small Island and has the most variety of guesthouses. Below are just a few of the options. Budget: Super-budget travelers should check out Symphony, a spattering of bungalows halfway down Long Beach boasting the cheapest beachfront digs. Rock Garden sits on the south end of the beach and offers cheap abodes for those willing to make the rickety climb to the bungalows perched on the hillside. Mid-range: Check out centrally located OhhLaLa’s Guesthouse on Long Beach. It’s got newly renovated rooms and dorms, plus the most popular bar/restaurant on the island. The rooms are basic but comfortable and are considered middle of the road in terms of price. Luxury: Bubu’s Resort has two location on Long Beach, one about mid-way down the shore and the other on the north end. The rooms are comfortable, secure, and boast all the amenities you’d expect from a higher-end hotel. The restaurant churns out tasty western meals and the cocktails are the best on the island. Even if you can’t afford to stay there, the restaurant/bar is the place to come for a fancy night out or pre-dinner drinks. Insider tip: If you want to stay on Kecil but prefer a quieter location, head 15 minutes across the jungle path to Coral Bay. There a fewer accommodation and restaurant options here, but definitely the spot to go if you seek peace and quiet. Pulau Besar is good for families and couples who seek privacy and alone time. With very few bars, the Big Island immediately reminds you that you are indeed traveling through a conservative Muslim country. You’ll also find that some guesthouses and restaurants don’t even serve alcohol. Also, keep in mind that restaurants close earlier on this island (around 10pm). Budget: It’s not easy to find budget rooms on the Big Island, but the best options can be found in Tuna Bay. Check out the rooms at Seahorse or Miss Lee’s. Mid-range: Mama’s Bungalows are located on a quiet strip of sand and offers a family-friendly or quiet-couple environment. The on-site restaurant closes at 10pm and alcohol is not served here. Luxury: Tuna Bay Resort offers spacious bungalows on the beach with its own cozy restaurant and bar (perfect for viewing the sunset). Located on the busiest section of the Big Island, Tuna Bay is the best bet for location, quality, and customer service. Tropical islands were made for chilling, and the Perhentians in Malaysia are no different. You won’t find a plethora of activities here, but that’s kind of the point. However, if you’re happy enjoying the simple things in life, then I guarantee you’ll be happy here. This is one of the best beaches for sunbathing, lounging, playing a friendly game of pick-up volleyball, swimming, and meeting other backpackers. With a spattering of beach bars and restaurants, it’s easy to pass the day without moving from your sandy spot. The Perhentians are becoming well-known for their excellent diving. With dive shops on both islands, it’s a breeze to find someone to take you diving. The variety of sites – ranging from underwater seamounts to massive shipwrecks – satisfy both novice and experienced divers. Never dived before? No problem. All the dive shops in the Perhentians offer PADI certification courses. 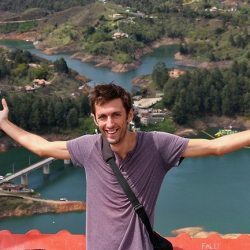 There are even half or full-day programs for newbies who want to try it out for the first time and don’t want to spend the time getting certified. 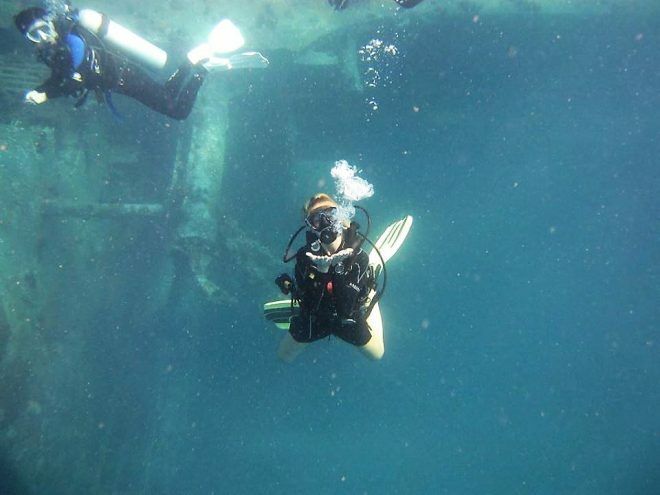 Even if scuba diving isn’t your thing, grab a mask and snorkel and explore the underwater world from the surface. The best places to snorkel on Kecil are along the edges of Long Beach and Coral Bay. 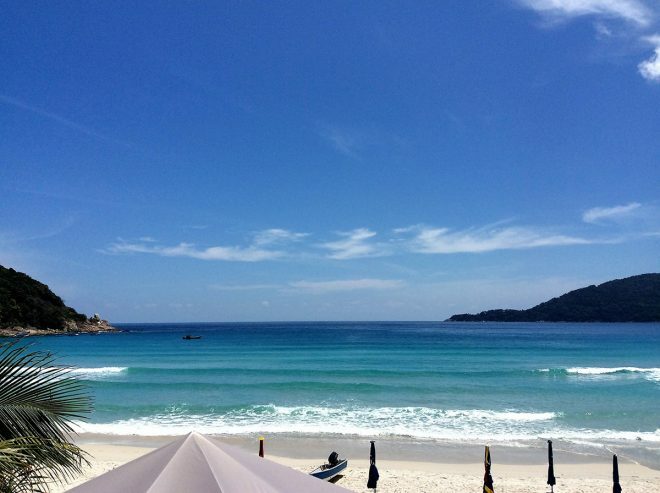 Besar’s best spots are around the pier near Perhentian Island Resort and Pro Divers’ World. Walk towards BuBu’s Resort on the north side of Kecil’s Long Beach. Continue walking behind the resort to find the rocky path leading up the highest point of Kecil. The trek is only about 25 minutes long, but yields stunning views over Kecil and the sparkling South China Sea. Coral Bay is accessible from Long Beach via a small jungle path with a trek of around 20-30 minutes. Explore beyond the bay’s boundaries and you’ll find remote little beaches with no one on them. Additionally, there’s a few Coral Bay restaurants known for hosting the island’s best evening BBQs. Don’t let the plastic tables and chairs fool you; these beachside restaurants serve a variety of awesome grilled seafood – complete with several side dishes – for well under $10 USD. Long Beach’s neighbor bay houses only one resort and restaurant, but is worth the trek over from Long Beach for lunch. Take the same Windmill Trek path as above and continue past the windmills and down the hill – the path terminates at D’Lagoon Resort. 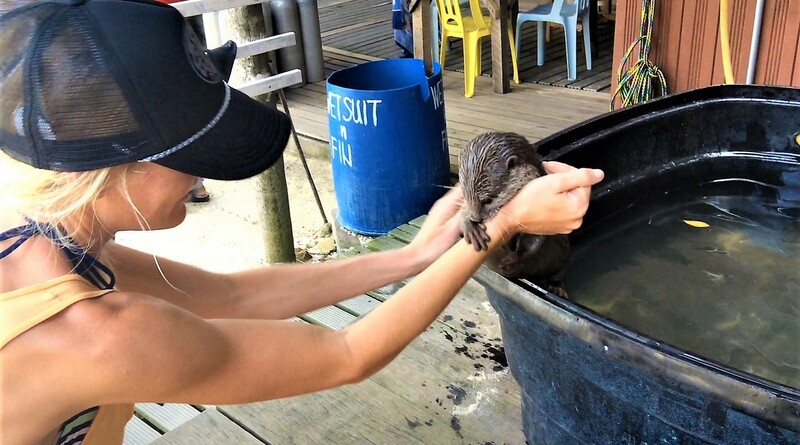 It’s a nice place to chill out for the day and you might even catch a glimpse of the resident pet otter scampering around the restaurant or snoozing in the sun! The best western food on the island award goes to OhhLaLa Restaurant. 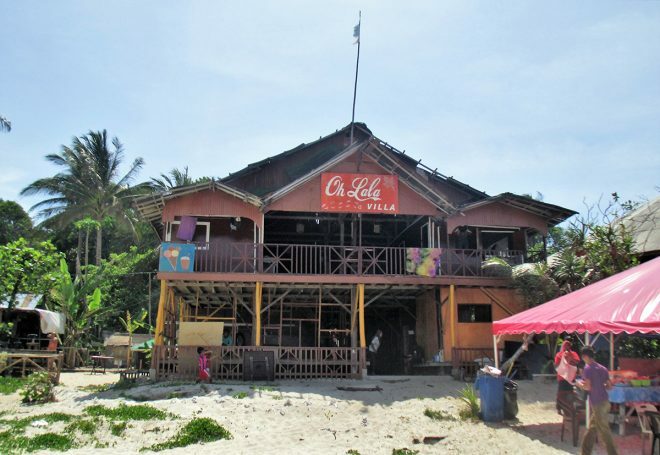 This bar/restaurant/guesthouse/dive shop establishment is a staple of the Perhentian Islands and a cornerstone of Long Beach. The wood-oven pizza is delicious and the burgers and garlic mayo hit the spot after a long day on the beach or in the water. During high season, the water on Long Beach is flat and calm. But the shoulder months coming out of and leading into the Monsoon season (March-April and September-October, respectively) create small yet surfable waves on Long Beach. You’ll mostly see the locals taking to the swell, but there is a convenient shop on the beach that rents surfboards. If you’re craving a little class on your beach-bum holiday, head to BuBu’s Resort. This is the nicest resort on the Small Island and is known for its fusion menu of western and Asian dishes. The cocktails here are unbeatable. For sunset views, head to west-facing Tuna Bay on the Big Island. There are several mid-range restaurants here with loads of outdoor seating. Perfect for a romantic dinner or sunset drinks. 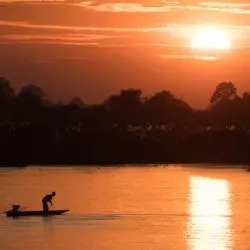 Insider tip: Taxi boats run back and forth between the Big and Small Islands all day and into the late evening, but expect to pay double the fare after 10pm. Despite there not being an overwhelming number of nightlife locales, Long Beach certainly hosts lively parties nearly every night. OhhLaLa Bar is a popular place to start the evening. After it closes around midnight, most people move on to Monkey Bar or Beach Bar. The smallest and simplest bar on the island is actually the most popular. There’s a party here every night and they usually host pretty awesome fire shows on the sand in front of their make-shift shack. You can spot the glow from the torches from anywhere on Long Beach. Throwing back a glass of “Monkey” is a Perhentian Islands’ Right of Passage. The home-made local rum is sweet, sticky, and caramelly and probably unlike anything you’ve tasted before. But it’s a must when visiting these islands. The sweet “juice” is best mixed with coke or sprite and sometimes goes down a little too easy. Many of the bars sell small bottles of it – and it’s cheap. The most peaceful way to start a day on Long Beach is enjoying the spectacular sunrise when the rest of the island is still sleeping. It’s quiet, cool, and you’ll have the beach all to yourself. 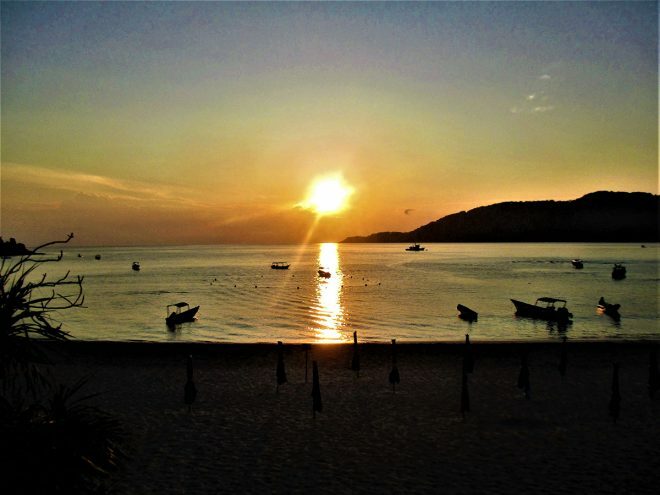 The Perhentian Islands are a special place that won’t stay that way for long. The more travelers that discover these paradisal isles, the more developed they’ll become. Kecil and Besar have fought to maintain their authenticity and laid-back vibes in a time where sprawling resorts and tourist traps reign supreme in Southeast Asia. So, GO! Before the exotic simplicity that makes these two islands so enticing is gone for good.